This is probably my favorite TV show of the year, and that is saying something in a year which wasn't light on watchable and compelling TV. 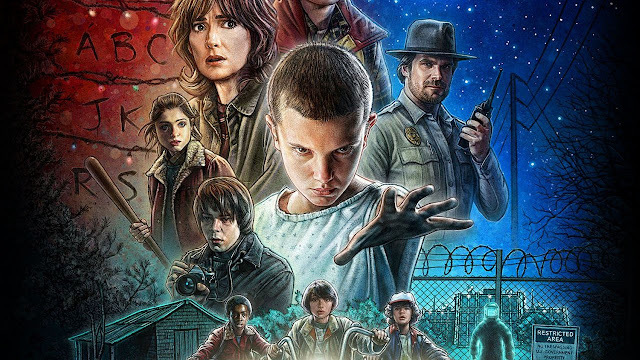 Stranger Things was, for me, the best show that Netflix have done so far. Doing anything period can be laced with pitfalls for movies and TV shows. The line between a genuine homage and something that feels like it is exploiting the setting is a fine one. It's easy for things to feel forced or fake when you're trying to ensure something matches the memories of any given era. Stranger Things on the other hand managed to invoke a large dose of ‘80s nostalgia while still crafting something decidedly unique. Part Goonies, part Stephen King, part '80s Spielberg, it took the 'Supernatural misadventures of teenagers' trope and turned it into something that felt fresh. It was pretty much a perfectly paced show. It's a great poster child for how right things can go with Netflix's 10-12 episode seasons format (something even the great Marvel Netflix shows haven't quite managed yet). Each episode moves things along and builds up the intrigue. There is barely a wasted scene in the entire season. Honestly, by the end, I felt like it was somewhat of a masterclass in how to pace a TV season. Coupled with a fantastic soundtrack and some amazing casting, everything clicked for this one. In particular when there are so many young leads playing the kids. If anything, the only issue is that it will take some serious work to match this in season two and keep things as interesting. If you haven't watched it yet, it's well worth binge watching over the holidays!